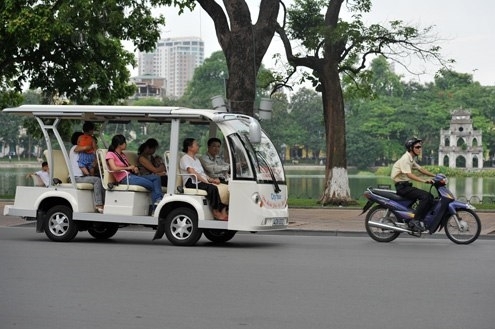 QUẢNG BÌNH — The Quảng Bình People’s Committee has approved a three-year pilot project for using electric vehicles to transport tourists on several main roads in Đồng Hới City from this month. About 24 roads have been chosen for the project, which will end in August 2019, such as Nguyễn Hữu Cảnh, Hữu Nghị, Quang Trung and Hương Giang, besides Quách Xuân Kỳ, Mẹ Suốt and Thanh Niên. The routes will also include 37 parking lots of restaurants, hotels, plazas and seaside areas. The approval of the project aims to diversify the kinds of tourism in the province, making them more attractive, and to meet the travel requirements of tourists. Cát Vàng Services and Trading Co Ltd, which will conduct the pilot project, plans to use 30 electric vehicles to transport tourists.